The dock outside our hostel. Perfect for early morning swims and fun nighttime adventures. Joe and Emily cutting a rug and looking as cute as ever. Fooling around with Joe and Connie. 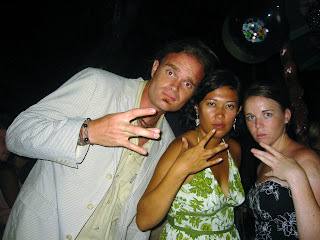 Honestly though, westside (Honduras) is the best side. 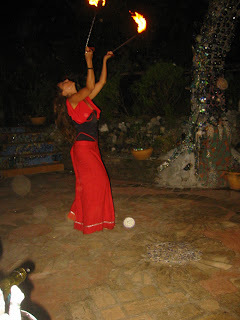 Fire dancer at the wedding. Super cool. I spent most of last week on Utila, one of the Bay Islands off the North Coast of Honduras for the wedding of my friends Joe and Emily. I had never been to the Bay Islands, let alone the North Coast, so needless to say, I was stoked about this trip. The wedding was held on Thursday the 21st but my friend Connie and I got out there on Monday to chill with other PCVs, several who have already finished their service but came back to Honduras for the wedding. 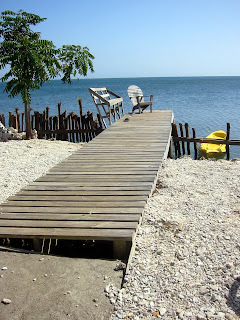 We stayed at this pretty chill hostel called Rubi’s which had a fabulous view of the Caribbean and a private dock, which we took advantage of for day swims, night swims and stargazing. I have never participated in a vacation wedding before but I really enjoyed this experience. We got to talk to a lot of people from Joe and Emily’s families about life as a PCV, they got to talk about how cheap things were for them in Honduras (and were extremely generous in buying us meals!) and most activities were done as a group so that by the time the wedding rolled around, I actually felt as though I knew a lot of the people at the ceremony. We still did traditional things, bachelorette party, rehearsal dinner and helping the bride get ready, but is was just so laid back and chill. 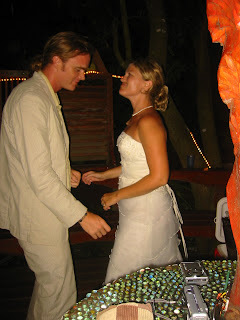 Connie married the two of them in such a sweet ceremony (of course I cried) and dinner was an excellent red snapper. Besides the wedding stuff, most of my days were spent at the beach getting dark (well, dark for me) and catching up with people that I hadn’t seen in awhile. If I were in high school, I would say that it was similar to the last few weeks of high school, everyone being friendly with one another, some people from last year’s senior class showing up and handing their wise advice to the departing seniors and juniors, and the wedding being like prom. It was a great wedding. Really great. I was in Guatemala about 2 weeks ago for a short girls’ trip with my friends Connie and Emily. What a cool trip it was…. I left San Ramon early on Sunday to get to Santa Rosa to get to Copan Ruinas to get catch a shuttle (read: mini van) to get to Antigua, Guatemala. We made great time only to get to the office to hear “Well, we have 2 spots available on the shuttle”. Two spots?! Really? You can’t cram in one more person? You never seem to have problems when I happen to catch one of the shuttles that has about 25 people pouring out the side doors… we decide to wait it out to make sure everyone shows up and as luck had it, someone didn’t show up and we made the shuttle! Hooray! After a LONG ride (sitting on the jump seat for 6 hours isn’t always the most comfortable thing), we get to Antigua right before dusk. Antigua is a beautiful colonial town with a volcano backdrop. We spent the next hour looking for a hostel, find this really cool spot called El Hostel and begin our search for some dinner. Antigua can be expensive for a budget traveler (read: Peace Corps Volunteer) and most of the restaurants we found were out of our price range. After 40 minutes or so, we find this woman selling food in a small park. Awesome, awesome street food….so good, that we come back the following two nights. The best thing we ate was this ‘bean filled donut’, which was refried sweet plantains formed into a ball and filled with mashed black beans sweetened with vanilla, cinnamon and sugar. It sounds odd, but it was fabulous! After a day of shopping in the artisan market in Antigua (overwhelming but sooooo worth the sensory overload), we took another shuttle to Lago de Atitlán. I cannot begin to describe how beautiful it was. A crystal blue lake with mountains and 3 volcanoes in the backdrop. Too gorgeous. 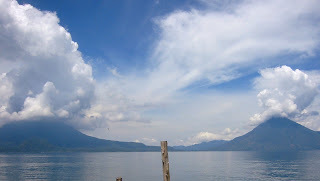 We took a boat out to some of the towns along the lake, shopped some more, ate some typical Guatemalan food (lovers of the black bean are always friends of mine), and enjoyed the scenery. I would have liked to have spent more time out there, but like I said, our trip was short and we took a shuttle back to Antigua that night and left early that morning for Honduras. It seems as though my darling rat that came soaring out of the ceiling in March has made himself (or herself) a home. I can hear it running on my roof or squeaking late at night. I don’t know what scares me more: the squeaking at night or the fact that I’m getting used to it. I woke up one night to hear it squeaking and running around on the roof and went right back to bed. Luis came over to crawl in the space between my ceiling a roof (it’s a little hard to explain) and he came down the ladder and said, “Yeah. It’s a huge rat. I mean huge. I scared it out for the time being.” I ran out of my house to see if it was on my roof (my house is on a decline) and there it was…14 inches of pure nastiness (that’s with tail). This rat was freaking huge! Luis came out with me and began to throw rocks at it and it ran into my yard. The next few nights were quiet. I thought that meant it had moved on, found a new person to bother, someone else’s pasta to eat. But then on Tuesday night, I heard the squeaking again. My friend brought me a bag of rat poison to put out for it. I put it on my kitchen floor, hoping that it would eat the poison, run out the back gate, and die in the yard, rather than in between my walls. I woke up Thursday morning to see that half the bag of poison had been eaten and fell asleep that night to the sound of it running along my ceiling. It is a super rat for sure. Now I just need to name it. the toughest job you'll ever love. tacuasín = honduran for aiiieeee!